When it comes to money, being selfish is the most selfless thing you can be. 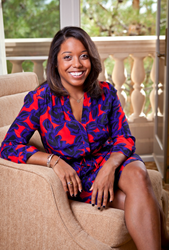 On March 10th, 2016 Nicole Peterkin is set to speak at the ‘Driven Cape Cod’s Conference for Women’ at the beautiful Sea Crest Hotel in North Falmouth, MA. Nicole (Nicky) Peterkin, will give a 50 minute presentation to the audience on being driven to your maximum financial potential. Peterkin built a career in personal finance to help people who are trying to do all the right things and keep all the balls in the air, but just don’t have the time and knowledge required to do it on their own. Nicky has seen so many people with salaries ranging from $50,000 to $500,000 per year who work hard and are very successful professionally, but have no idea how to actually plan for their future. They don’t know the strategies necessary to protect what is important to their families while maximizing every dollar they earn. She believes that people have to have a plan that looks out for their interests, because no one else is going to. This is not just about being prepared for when the worst happens, but also so they can have money to enjoy all of the good things life has to offer. Recently Peterkin was interviewed by the event’s planner and visionary, Marie Younger Blackburn, for the Driven Women TV channel. During the interview Nicky shared her own personal experiences in finance and how the unexpected death of her father launched her into a career as an adviser. “I never thought I was going to have a career around helping people create the lives they deserve by creating a plan for their money. I was going to be a surgeon. I was in school for Pre-Med taking business and economics classes as my electives to round out my education, when I was hit by a freight train. My dad passed away, suddenly, unexpectedly, at the age of 47 when I was 21 years old. My family, which now consists of my mother, sister, two brothers and I, were in shock. We felt like our lives were in shambles. We were simply not prepared emotionally for the tragedy, and frankly we had no idea whether or not we were prepared financially either. My parents made good money. They had a solid multi-six-figure income between them, and we had nice house in one of the nicest neighborhoods in town. Growing up, I had everything I needed and much of what I wanted, and yet when my father passed away we were so unprepared it was scary.” Peterkin shared. For the upcoming event, Nicole plans to share with the audience her story, unconventional ways to get a financial edge, and how to work half as hard at the money game while having twice as much to show for it. The conference aims to foster growth and collaboration, while empowering and inspiring women with useful, relevant information.